Gooey cinnamon biscuits are a fun biscuit to have around Easter time. You start out with a biscuit and a large marshmallow and then you end up with a empty biscuit and some yummy goodness coming out of the middle. I have seen these biscuits used as an analogy to the empty tomb. I got this recipe out of my mom’s family cook book. But really the first time that we had these was when my daughter introduced them to us one night when we were outside roasting hot dogs. So if you are very patient you can also cook the gooey cinnamon biscuits over a camp fire. They are very tasty and it is always a big surprise when you go to eat your biscuit and it is empty. They are fun to eat with ham and potatoes; add a vegetable and you have a wonderful Easter dinner. Oh ya and don’t forget my very favorite cup cake of all time, the Kneaders copy cat Easter cupcakes. They are my favorite because the flavor is so amazing and they are so soft and fluffy. Be careful if you do make them, they are just a little addicting. And who doesn’t love Cadbury eggs on top. They make these cupcakes the best ever. What are some of the fun Easter traditions that you enjoy? I remember as a kid that we would boil eggs and then the next morning we would all take turns hiding them. We would leave them out for hours, and then most of the time we would even eat them. I am surprised that we are alive to tell about it. I know that it is not a good idea to eat eggs after they have been out of the fridge for awhile. We would also get a little candy and our Easter baskets, were recycled whip topping containers. We did not have extra money growing up on the farm, and so we made due with what we had. We loved Easter and we loved hiding the eggs for each other. My favorite year was the one that we could not find one of the eggs. About a week later, my mom found it. Yep, it had rolled way under the couch. The way we found it was by smell. I also remember sometimes we would have a few eggs that had been in the fridge for too long. We would take the eggs and see who could throw their egg the farthest. I am pretty sure since I had 3 older brothers, that I never won that contest. We never had plastic eggs either; they didn’t seem to be the thing back then. Below is a picture of the biscuits with the marshmallow inside. the seam of the biscuit is on the bottom. After they break, they rise a little and come together. They look like a cute flower in the round pan. 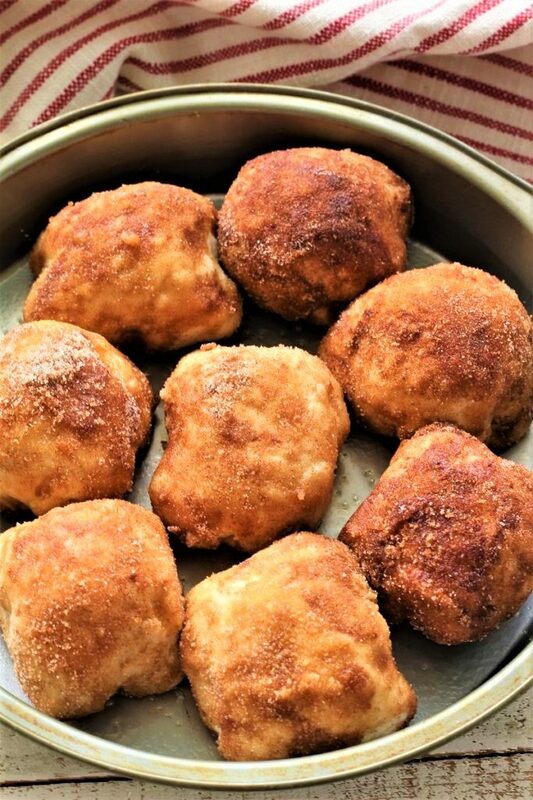 So, I hope that you get a chance to make gooey cinnamon biscuits and to be honest with you, they would be really good for Easter breakfast too. They are very simple to make and you can double them if you need a few more. i hope that you are getting ready for Easter and that you remember that it was Easter that made everything possible. I love Easter and I love teaching with things that are symbolic so that we you can have memories and kids can remember things better, not only kids, grandma’s too. 1- I like to pinch the biscuit together at the bottom before putting it into the butter and cinnamon and sugar. 2- For fun, try replacing the marshmallow with a peep, you might have to cut it down a little to make it fit inside the biscuit. 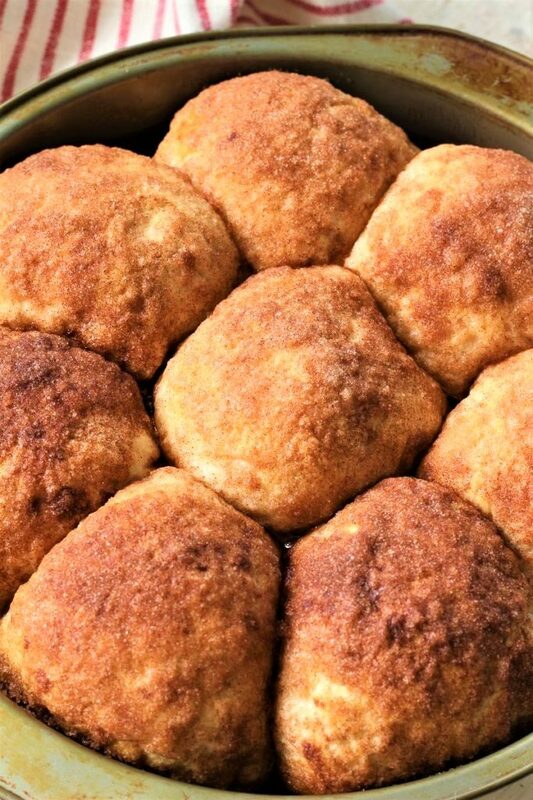 3- I baked my biscuits in a 9″ round pan. 4- I think that gooey cinnamon biscuits taste the best while they are still warm. Open the biscuits, separate them and flatten them. In a separate bowl, mix the cinnamon and sugar. 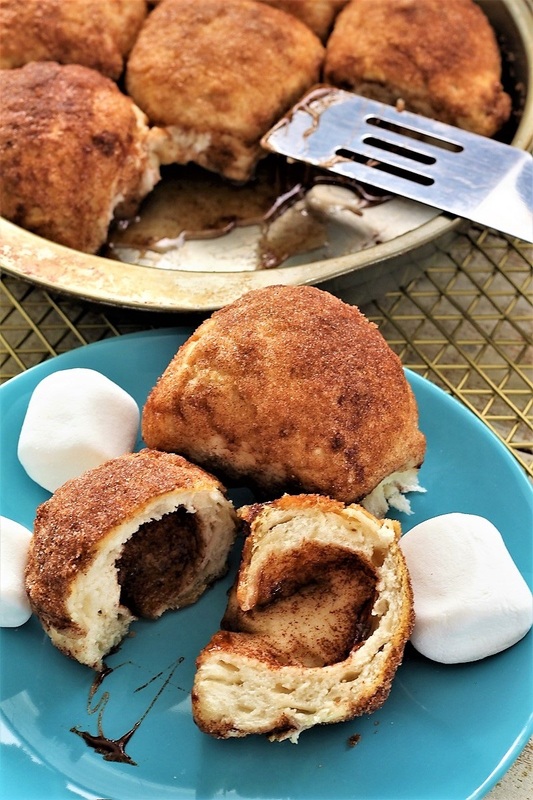 Take a marshmallow and dip it into the butter, and then the cinnamon and sugar. Place the marshmallow in the center of the biscuit, bring the sides of the biscuit up around the marshmallow so that you cover the marshmallow. Then take the biscuit and dip it into the butter and then into the cinnamon and sugar again. Place the biscuit into a greased 8" or 9" pan. Repeat until all of the biscuits are used up. Place them equal distance apart. Bake for 15 - 18 minutes or according to package directions. So easy and so yummy! These sound amazing and perfect for Easter morning. They really are easy and so yummy! I hope you are all ready for Easter!